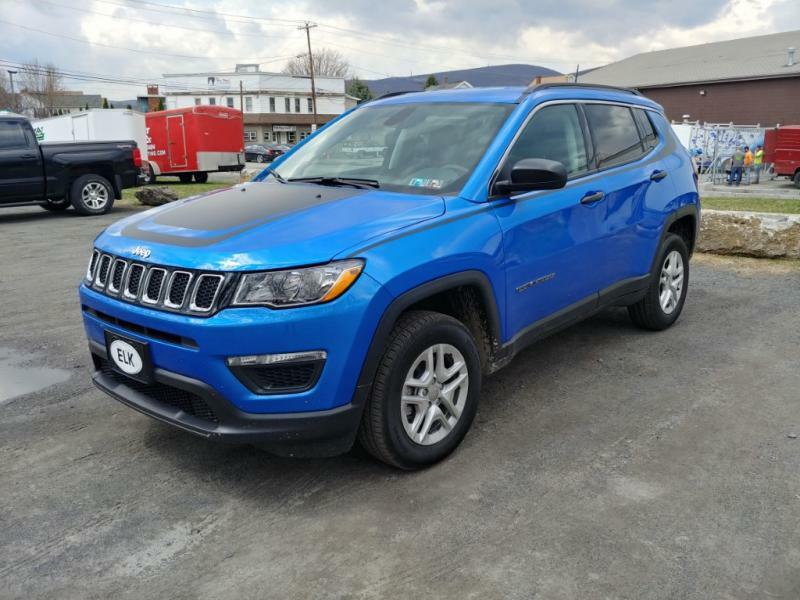 My name is Mike and last week I bought a 2019 Jeep Compass Sport. This is the first Jeep I have ever owned and so far I am happy with the way it drives and handles. 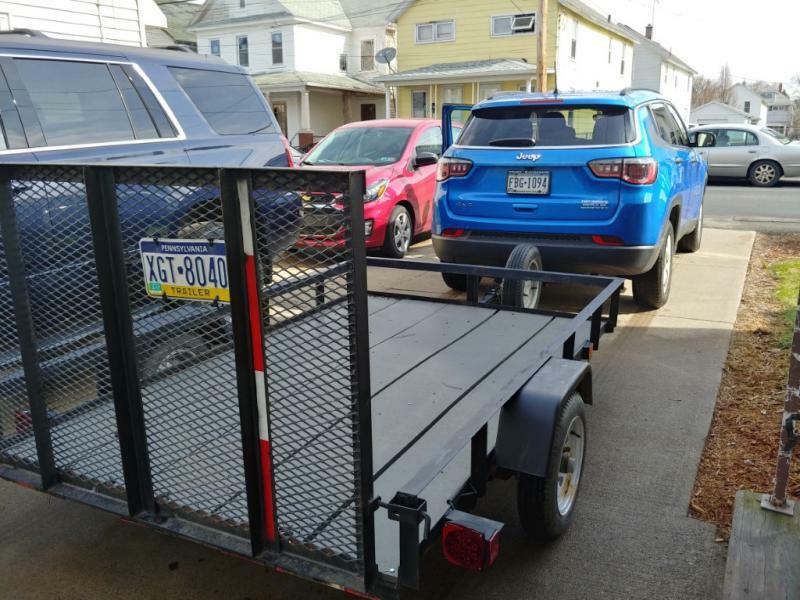 This vehicle replaces a Saturn VUE which I had for 16 years and ran well, but being from Northeast PA, undercarriage rust ruined the vehicle. I was a Saturn owner for 26 years. I like the fact that this vehicle is capable of light towing, this week I will have the tow package installed by U Haul. I tried to get it from the dealer but the parts were not available and not known when they would become available. For my heavier towing needs I have a Chevrolet Tahoe, but the Jeep is going to be my daily running vehicle. To be honest I went for the Jeep mainly because it was available with a manual transmission. I have driven a manual all my life and did not want to give that up. The Tahoe is an automatic, but its not my daily running vehicle, and I needed a towing vehicle with a decent capacity, so in that case I had no choice. 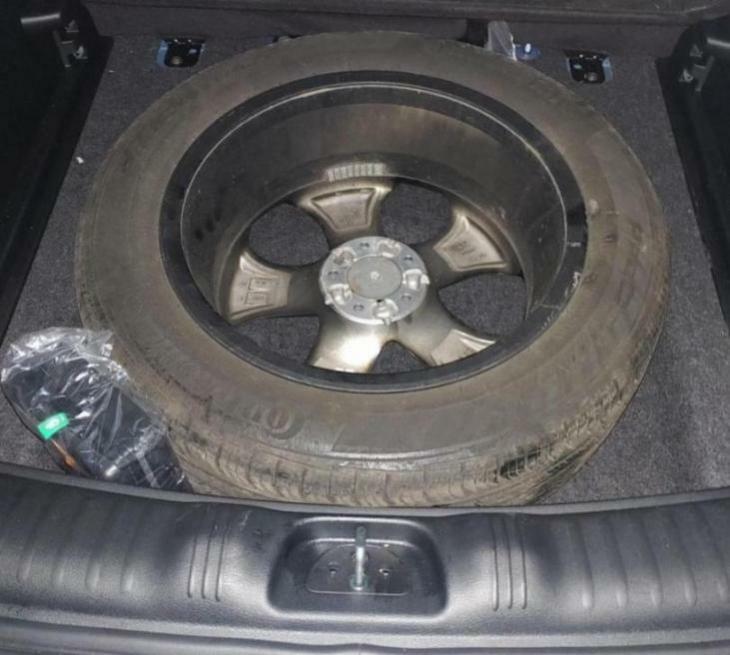 The only thing I was taken back by was the lack of a spare tire, I do understand that some vehicles don't include one but there is space for one and when I asked about the spare tire package, it came up as not available with no known date of when it would become available for purchase. That surprised me as I would think they would have that as a stock item. I would rather carry a spare as our roads are known for potholes with the thaw & freeze cycles we get here in the Northeast. Welcome! Yeah, I agree about the spare. In my life about half the flat tires I've had were catastrophic, e.g., blowout, tread separation, cut sidewall. Most of the other flats were nails in the tread that made for slow leaks. Having a flat just happen, then pumping it up, has not been my experience. I guess I should get a spare. What's with this kit? Isn't a mounted spare all we need? From looking online for this kit, it includes not only the spare tire, but a replacement for the mounting tray where the compressor is placed to hold the spare and also the jack and lug nut tool. The jack fits inside the tire mount. Picture attached from the website. The best lead time I could find so far is 2 to 3 months out. In the meantime, I bought a plug kit and put that in the trunk area. Thanks Mike. As I said, I may look into that. I do kinda like the extra storage space without it, but a spare is something only needed every couple years, but when you need it, you need it. Our area is known for potholes, a sidewall hole would make the compressor and slime kit useless. 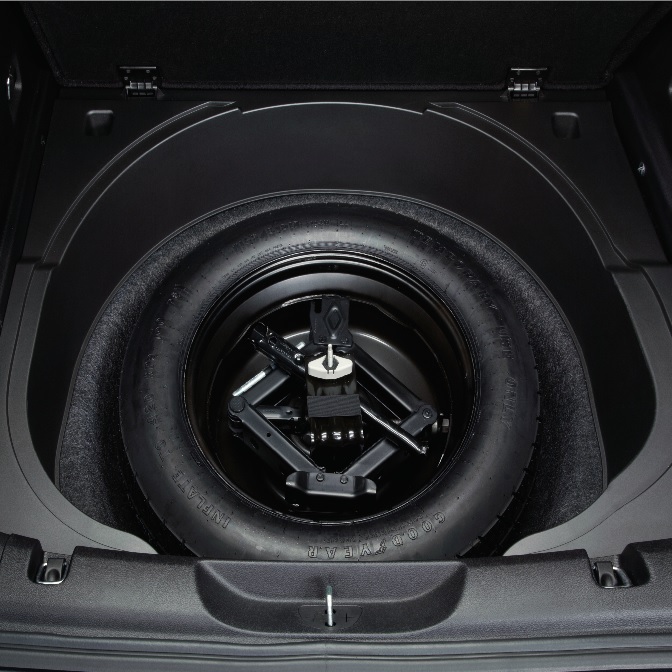 The extra storage space is nice, but I would rather have the spare tire. Here is a picture of my new Jeep, today I had the tow package installed by U Haul since I couldn't get one from the dealer. I put my stock 18" in the spare well when i changed my wheels. Now my wife has a full spare. She'll have to make do without the extra space. What did you do for a jack and lug nut tool? Had the hitch installed by U haul this week. I was using one of those tri-ball drawbars with the Saturn (basically a zero drop) Ill have to hook the trailer up to see if its level with this setup, it might be a little lower then it was with the Saturn. Worst case, I have some 2 inch drop drawbars and I can just flip the balls around to make it 2 inch rise. Nothing yet. but at least roadside assistance can change the tire instead of having to tow it. Yesterday I wanted to see how level the trailer would be with the hitch. 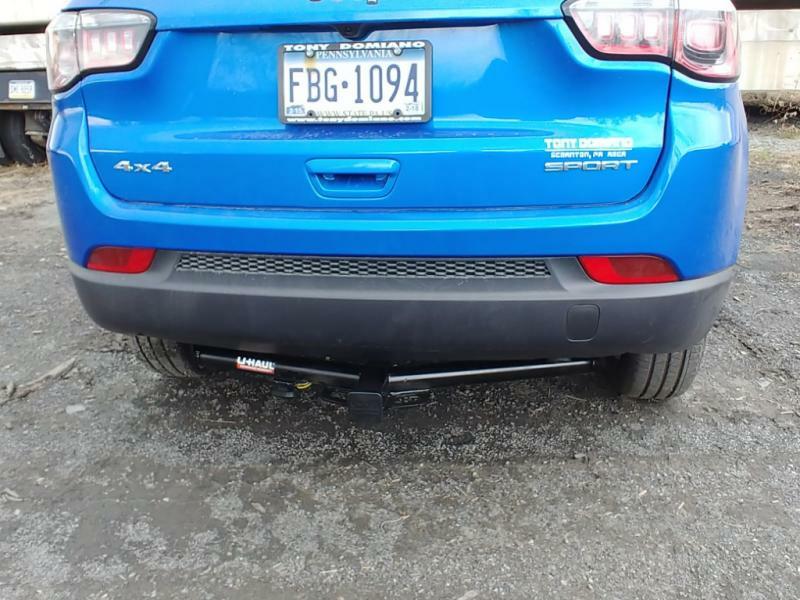 It appeared like this hitch setup was slightly lower then was with my Saturn. I was using one of those tri-ball draw bars, basically a zero drop draw bar. This one is handy since I need both 1-7/8" and 2" ball at times. Looks to be pretty level, maybe a slight rise, so it isn't much different then the Saturn. I do have two 2 inch drop units, one already has the 2" ball, went out and bought the 1-7/8" ball for the other and will see how that looks. I do realize that the towing capacity of this Compass is 2,000 lbs. It is nice to have a towing vehicle for light duty. 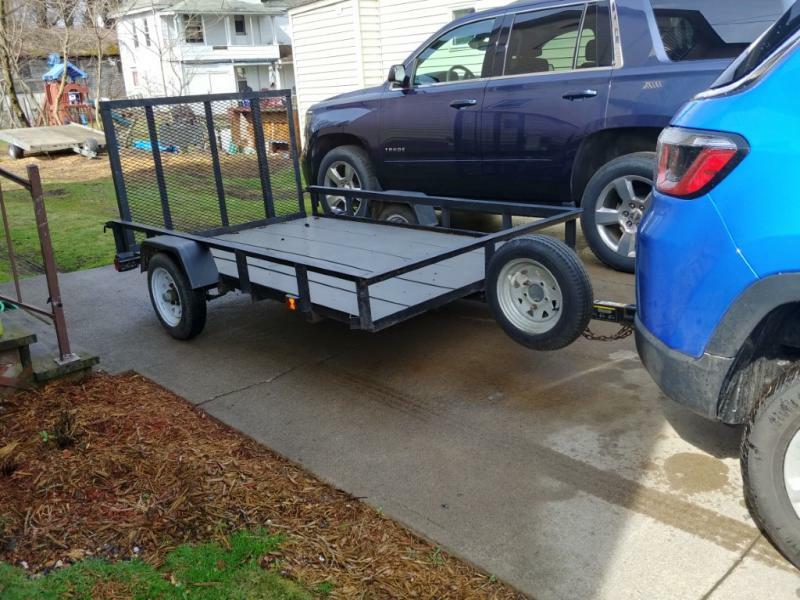 I have the Tahoe for pulling our ATV trailer / tent combination.